Starring a bunch of Japanese or American voice-over actors, depending on which dub you'd prefer to listen to. Rated: PG-13/M15+ (American/Australian rating for...well, a bunch of violence, some adult themes and a bit of naughty language). Okay, so, who in the class knows what 'anime' is? Hands up. Wow, that's a lot of you. I shouldn't be surprised - you're all very highly educated people with good taste and nice haircuts. And I bet you all smell nice, too. But for those of you who don't know, it's that genre that's often mistakenly referred to as 'manga' and sometimes referred to in a vaguely racist manner as 'Japanimation'. The Japanese have an absolutely booming animation industry. Ignoring the huge business they generate in the western world, animated films in Japan rank highly in box office grosses, where animation isn't seen as purely child's fare. Sure, there are cartoon kid's movies, but there's also stuff for adults. 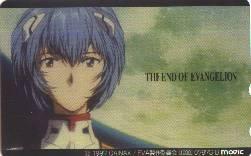 The End of Evangelion is an example of an animated film that's not for the kids. Let me begin this by stipulating that, if you haven't watched the anime television series Neon Genesis Evangelion, you shouldn't start by watching this movie. I mean, look at the title - it's the end of the entire story. You're not going to understand what's going on, much as you wouldn't understand what the hell was happening in a play if you walked in on the final act. So, if you've never heard of Evangelion before, take this review to be in support of both the movie and the excellent, groundbreaking, immensely popular TV series that preceded it. Consider this review as a glimpse at the treasure that awaits you at the end of the rainbow. And believe me, The End of Evangelion is a treasure. Neon Genesis Evangelion seemed to be nothing more than your typical giant robot sci-fi anime series when it debuted back in 1995. It was full of blue-haired characters, large action pieces, goofy comedy bits and a smidge of T & A. But slowly, as the series progressed, it became evident that there was something else lurking beneath the surface of this show. Religious iconography and occult mythology was used in new and imaginative ways, layering meaning into a show that dealt with psychological and emotional issues in intense and visceral ways. onscreen explanation for how the audience got there and what the hell it all meant. So, in response to the outcry, The End of Evangelion was crafted - two new episodes that are meant to supersede the final episode of the series and give fans a greater sense of closure. And there's closure. And there's not. And, man, is it ever amazing to watch. There's so much in this film to give college professors and university tutors to mull over and debate and analyse. It's nine months pregnant with meaning, with symbolism and with psychobabble. It's an epic in the greatest sense of the word, and if fans were left scratching their heads with the way the series originally ended, they're left downright flabbergasted by this bombastic display. The End of Evangelion reinforces in my mind why I like anime so much, because between the giant robot battles and the Christ metaphors, you gain an appreciation for how there's nothing like this coming out of Hollywood at the moment, if there ever even will be. It's not something to be viewed lightly, and as I said earlier, it's not something you can just walk into cold. But if you put in the effort, if you watch the series and then watch this movie, it will give you something that'll hook you, that'll keep you coming back over and over again for another go, for another try at unravelling the mystery. And even then, you'll still be left wondering. But that's all part of the fun, isn't it?